Institute of Health Systems has signed a memorandum of understanding with the University of Iowa, in USA, and its college of public health for educational, training and research collaboration in the area of public health. This comprehensive collaboration will facilitate joint educational, training and research activities, exchange of scholars, faculty and students. The University of Iowa, is a comprehensive public university , established in 1847, with about 1700 faculty, 6000 professional and scientific staff and 300000 students, spread over 13 colleges. The UI College of Public Health, established in 1999, builds on a rich tradition of public health teaching, research, and service that dates back to 1885 at the University of Iowa. Over the years, University entities such as the University Hygienic Laboratory and the Department of Preventive Medicine and Environmental Health helped to address many of the most pressing public health needs in Iowa, including the control of communicable diseases, the safety of water and milk supplies, the health and safety of farmers and others living in rural areas, surveillance of cancer and birth defects, and emergency sanitation needs. The College of Public Health is accredited by the American Council for Education in Public Health. Today the College is composed of five departments: biostatistics, community and behavioural health, epidemiology, health management and policy, and occupational and environmental health. The College of Public Health provides an educational and research focus to the many public health efforts taking place at the University. 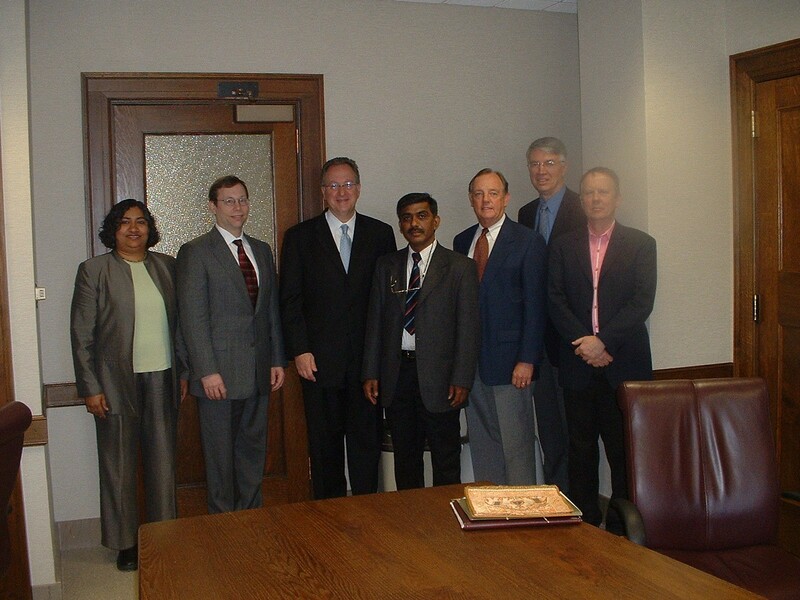 The MoU was signed at Iowa City, on 13 April, 2005. Dr. Prasanta Mahapatra, President of the IHS, Signed the MoUs on behalf of the Institute of Health Systems. The memoranda were signed, on behalf of the University of Iowa, by Prof. David J. Skorton, President, Prof. William Reisinger, Dean International Programs, and Prof. James A. Merchant, Dean College of Public Health. The MoU will be administrated at University of IOWA by Usha Balakrishnan (Director of Corporate Affairs, UI) and the IHS by C.K.George (Director IHS). Dr. Mahapatra visited the University campus for one week from 6 - 13 April, visited the university facilities, and held wide rangin discussions with University of Iowa faculty. Two joint research projects have been identified as a priority to kickstart the collaboration. These will be in the area of (a) road traffic injury, and (b) water quality monitoring, consumer empowerment and its impact on incidence of water borne diseases such as gastro-enteritis and jaundice. The University of Iowa College of Public Health and the IHS will co-host a National Conference on Public Health Capacity Building, in January, 2006. The proposed conference will take stock of the current status of higher education in the area of public health and seek to identify feasible solutions for training of highly skilled public health professionals in India.